financial markets work for people & the planet? 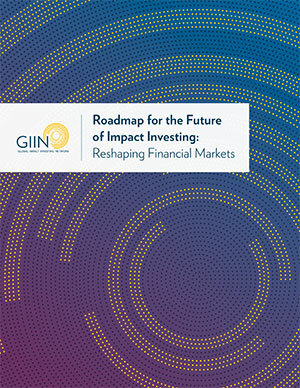 The GIIN envisions a fast-approaching future when social and environmental factors are integrated into investment decisions simply by default, as the ‘normal’ way of doing things. The value proposition of impact investing (and other forms of investing that integrate impact), will enjoy wide acceptance, with plentiful evidence in their favor. Businesses and investors will hold themselves accountable to multiple sets of stakeholders, including shareholders, employees, customers, suppliers, affected communities, and local and global environments. The concept of ‘externalities’ will be relegated to history, with finance theory accounting for risk, return, and impact equally well. Ultimately, financial markets will be central in supporting solutions to critical threats facing the world. Since the term ‘impact investing’ was first coined in 2007, the industry has made tremendous progress on various fronts: in the volumes of capital deployed, in the sophistication of impact measurement and management practice, in the demonstration of returns and impact achieved, and in the diversity of actors involved. Despite this positive momentum, impact investing is still a relatively small, niche area of broader investment practice. This report lays out a Roadmap for the Future of Impact Investing with six categories of action that the impact investing community needs to take on to exponentially enhance and scale impact investing, and to accelerate progress toward our vision. This work needs to begin immediately and with urgency. While full realization of our vision will take time, the problems we face are substantial and many portend significant near-term challenges. The steps we take today will not only address the most immediate and pressing needs, but also set in motion ripple effects far into the future. For each of these six areas, the Roadmap offers a number of specific actions, which will need to be taken on by a diverse range of actors, including those centrally dedicated to field-building (such the GIIN), as well as pioneering impact investors, wealth advisors, academics, governments, and funders. Copyright 2018 Global Impact Investing Network. All rights reserved.